The Wreck of the Lucy. Perched on the rock like a lifeboat going down a ramp, the unmanned ship re floated itself on the afternoon's rising tide and, but for the attentions of one local diver who watched it patiently, would have been lost in a snow storm that evening. She now lies in North Haven Bay, on the north side of Skomer Island in 41m of water. With Skomer Island being a marine reserve, it was decided that the wreck be permanently buoyed to prevent the damage that anchor dragging for the wreck might cause the seabed. As other Ribs were skidding across the smooth, sheltered sea to this same site, we resisted the temptation to moor up to the Lucy buoy, opting instead to keep the engine ticking over a little way off. Other unthinking coxen`s clogged up the descent zone making it difficult for buddy pairs trying to get to the wreck. Down the buoy line to the bow at 34m, visiting divers will clearly see that the ship is upright on a fairly even keel and very intact. Moving aft, it is possible to swim from the fore deck down either of two sets of lightly overgrown steps to the main deck. Here, the two forward holds are full to their hatch beams with the now useless cargo, as well as spider crabs. Swimming past the holds, the superstructure, containing the crews quarters, bridge, and engine room, rises two deck levels above the main deck. Choosing to fin along the starboard gangway, my buddy and I entered the ship's superstructure from the single doorway on our side of the vessel. A second similar doorway in the port side allowed in extra light as well as providing a safe exit, so we were able to briefly swim inside and around the gloomy cabin area, whose only life now, is perhaps the swinging torch beams of visiting divers. Outside, back on the main promenade deck, on the port side of the Lucy, we saw two sets of skylights on the deck near the aft of the ship. These lead down to the engine room, and are an ideal 'clean water' exit for experienced divers carrying out a penetration down to the engine room from the inside decks - infinitely more preferable to retracing a silt trail. It is possible to swim down through the deck levels via a staircase inside the main superstructure, though it goes without saying that such penetration requires reconnaissance dives, as well as fairly substantial decompression requirements. As yet, Nitrox is not locally available, so such stops would be long ones. Most divers, though, will approach one of the external doorways and, seeing another doorway on the opposite side of the vessel, enter the superstructure for a quick look around before exiting from the other side of the ship. The aft deck rails, at a depth of 26m, are festooned with pastel-shaded plumose anemones which, if you are lucky, are fully blossomed out, and feeding. Such gently muted colours are, for me, so much more enjoyable than the gaudy hues of an exotic coral reef. As the Lucy is a small coaster, it is perfectly sized for the depth and viz., so that most divers may appreciate the classic ship lines, as opposed to the huge football-sized acreage's found on larger wrecks. They will also be able to enjoy a full circuit of the uppermost decks of the vessel, and return to the buoy line in 18-20 minutes. Though the currents that churn through Jack Sound can be quite fierce, the currents in North Haven, where the Lucy is, are generally mild. 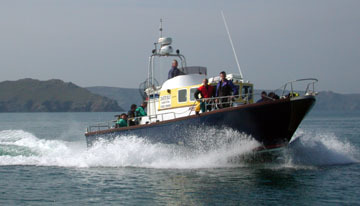 During tides of less than 6m, the wreck may be dived at any state of the tide, but during tides of more than 6m range, the wreck is best dived either 2 hours after low water Milford Haven, or 2 hours after high water Milford Haven. The currents can be strong, and the area open to winds from the N N/W. The Lucy is the most dived upon wreck in the area with its deck at 32 metres and dropping down to 40 metres over the side. There are a few places where you are able to penetrate her. The way that we dive her is go right as you reach the deck, down the steps to the deck area continue until you reach another set of steps, go up and travel along the companion way. Next go through opening to the rear of the boat, turn right and continue up the steps onto the rear of the bridge head. Forward is the mast which is covered with Plumos. Go forward and drop over the bridge face onto the bridge windows. Look through the right window and you will see a hatch on the ceiling, enter through the window (the radio area is to the left, back) Go up through the hatch or through another window and drop back to the deck area. Continue forward to the fore deck from where you came and continue up the line to the surface. For safety stay on the wreck at all times. At the stern you can drop over the side to where the prop once was and swim under the Lucy and back up the other side. Dive time N.D. is 25 minutes. The line up is marked at 10 metres and 6 metres for your safety stops. Slack water is 2 hrs after HW Milford Haven. At springs care should be taken as we have know slack water to last 5 minutes!! The corridor that runs across the ship has a number of rooms and passages off it. Firstly, don't confuse the corridor with a similar sized door nearer the stern, which gives access to a room nearly full of silt - you should be able to see green light clearly through the corridor. If you enter the corridor from the port side, the first door on your left gives access to the front rooms. This starts as a short corridor, but quickly opens out into a large room, lit by the large front windows, through which you can exit. There is also a hatch in the roof near the way in from the corridor. This room, and the corridor, can be safely entered without lines, if you are sensible. The front room has a small washroom in the rear starboard corner. Also off the corridor, is the ladder to the engine room (next opening past the entrance to the front room - also accessible from vertically above, via a hatch near the funnel - sometimes shut! ), and the companionway to a series of lower rooms (opposite the engine room ladder, companionway almost blocked with silt). I wouldn't go into either of these places without a line, and the rear room full of silt can be alarming as well. There is considerable silt throughout the wreck, though with care the corridor and front room stay clear.